Still, I enjoy the opportunity to visit the major Diving Spots in and around Cebu whenever we visit the family. For us it is a perfect possibility to combine my wife's family requirements with my diving hobby. Over the years I had the chance to gain a significant amount of experience in these local waters. In this section, I will share a few of my photos and my personal experiences. .... close to 150 dives in the Red Sea, Caribean Sea and of course the majority of them in the Philippine Waters in the Visayas Area. Moalboal is probably the most popular diving place in the Philippines. Even if the place is named Moalboal, it is actually Panagsama Beach, which is where the waterfront is and all the dive centers are located. It is a busy place - well relative busy - with about 10 to 12 different dive shops, some of them co-located with small resorts, others independently. They all bring the divers to more or less the same dive spots. My favorite one, where I have made the best experiences in regard to quality and safety, is Savedra. In Panagsama Beach you have along the seaside and main street the choice between many native restaurants which provide you all kind of local food. Most recommendable is fresh fish. Even an Italian pizzeria is waiting for the hungry tourist. When it gets dark, a few bars open, where you can get your drinks at very affordable prices. Here is where you can meet the dangerous species of "Land-sharks", some of them more beautiful, others less, are awaiting for the lonely diver. In any way, they will do anything to entertain you and give you a pleasant evening and - if you want - ... . So there is a very basic night-life. It is a "divers village", people who seriously dive the next morning, behave at night differently than the "Mallorca party people" so there is no way to compare the two. Thanks God the "Party People" would be bored to death there. Most of the dives taken from Moalboal are wall dives along either the drop off into the Tanon Strait along the coastline of Cebu or around Pescador Island. Especially Pescador Island has interesting features like smaller caves or a cathedral, where you can dive through. The variety of species you encounter is huge and the impression that nature is still in order prevails here. Sunken Island sticks out from the other dive spots. It requires a descend into the deep blue - at 25 m depth you reach a plateau. There you find, especially at the edges, lots of Lionfish. It can get a bit tricky there, when the current is very strong - which is almost always. :) Not really a "beginners dive". As the Tanon Strait is relative narrow and the tides move the water up and down the Strait, most of the dives there are Drift dives. Depth are between 35 and 25 Meter, with some exceptions in either direction. The translation of Liloan means whirlpool. I have never seen any stronger currents and whirlpools than at this place. It is because it is just at the Southern Tip of Cebu, where the Tanon Strait is most narrow and meets the water from the other side of Cebu. Sometimes you can hardly get to the boat - the water just pulls off your feet and grabs you. However current is good for the underwater life - so you find there nice corals and lots of other plants which needs constant supply of fresh water. An interesting feature there is, that you find "vertical thermoclines". Due to the strong currents you can within very short distance have extreme temperature differences. Usually the water is about 27 C. But 1 Meter ahead it might be only 21 C.
The cold water is pushed up from the depth. Sometimes you can see these temperature borders as the water seems to be glittering there. You don't have the steep walls here, its more a nicely sloping terrain. The village of Liloan has only 2 dive centers - a Korean owned one and a Japanese owned one. I have made good experiences with the Korean one. 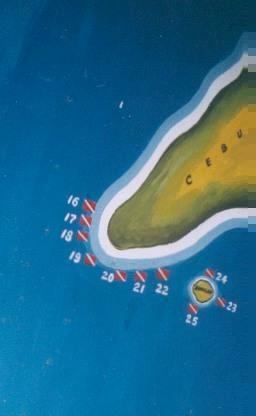 After all, this is the diving location, which is the closest to Dalahikan. Panglao is a the main tourist (dive) area of Bohol. From the White Beach (every Island has its White Beach) you start with bankas to your dive trips. Main attraction is Balicasac Island (drift dives along walls). There you see also plenty of Baracudas and Frogfish - a nice and interesting mixture. I have not seen anything which I haven't seen on other Philippine dives before, but the variety is big and therefore it is recommendable. Camiguin Island offeres some very nice dive opportunities. From white sandy slopes to dark black volcano passages and last not least Nudibranch City everything is available. My favorite dive spot is the "Old Volcano" where you dive through narrow passages in very dark lava rocks. It is really an impressive island at the northern tip of Cebu. White sandy beaches - an exotic paradise - often compared to Boracay - but much much quieter and therefore more sympathic. To see the Tresher sharks you have to be between 5 and 6am (!!) at a certain area, lying in 30m depth and waiting for the sharks to arrive. If you are lucky you see them you have a lifetime experience, if not, like me- I tried it twice- you waste 2 dives for nothing. There is no guarantee. As the beaches are sandy in Malapascua it is, with the exception of an artifical reef - sunken jeepnees wrecks - relative boring to dive there. Therefore the dive boats bring you to other islands in the wider area. Gato etc. However. this means that you have relative long transit times (up to 2 hours and more) between dive sites. You require plenty of sun protection before you climb the banka, when you return the day is more or less over. I personally find this sub-optimal. Apo Island is famous among divers. Basically that is because of 2 reasons. The Cogon Dive (2 on the map beside), and the Clownfish City Dive (4 on the map beside). Cogon Dive is a drift dive along the East coast of Apo Island. The current there is quite strong usually, sometimes really extreme strong - so it can get a fast and wild ride. That is what the millions of schooling Jackfish like. Almost on every dive you meet these huge Jackfish Schools. Often they just "swallow" the diver and you find yourself surrounded by millions of fish bodies. An absolute highlight. All along the east coast there is a fishing sanctuary - that might be one reason why we still have these immense schools of Jackfish there. The other famous dive on Apo Island is the "Clownfish City" Dive. It is in shallow waters up to 10 meters depth and the home of thousands of clownfish. It is really amazing and even "Nemo" would be pround to live together with so many companions. have lost another natural treasure. The remainder of the Apo Dives are upper average - with plenty of nice hard- and soft corals and lots of fish. The Island hosts 2 Resorts, however, public electricity has limited operating hours - all energy is provided by diesel generators. It is quite a remote place - and probably not easy for the Resorts to provide higher standards for tourists. I prefered to base in Negros and come to the Island for diving rather then staying there. Dauin is located about 12 km South of Dumagete. The first impression is, that this can't be the ideal diving location because of the sandy. slightly sloping beaches. Anyway, I was pleasantly surprised when I made my first dives there. Especially the dives in the Dauin Sanctuary offer a wide range of interesting fish and creatures to watch. It also depends of course from the experience and proficiency of your dive guide. I was lucky enough to make my dives with Glen, a Pinoy dive guide working for the Atlantis Resort, who knows each and every of the fish in his backyard by name and birthdate. His knowledge makes these dive worth doing them. While some of the dive spots are build around artificial reeves with the use of truck tires and a sunken banka the sanctionary provides natural nesting and housing for the fishes.